Most of the time I potter away here doing things that make life easier for us. Hanno does the same, although he usually works outside. My daily tasks include cleaning, organising, mending and looking after the vegetable garden. I gather herbs for cooking, I peel vegetables and fruit, I make stock and sauces and place a home-cooked meal on the table every day at 12 midday. I don't watch the clock to do that, it just happens that way. Every day I make our bed and instead of thinking about getting through it fast and what I'll do next, I think about the bed and how to make it comfortable. We all spend a lot of time in bed and it helps us relax and sleep so we have the energy to do the work we need to do each day. All those thoughts help me to not just pull up the doona/quilt, they make me slow down, fluff up pillows, adjust crooked sheets, make sure the side tables are dust-free and that when I walk away, job done, I've done the best I can do and we have a clean and comfortable bed waiting for us every night. I wonder if there are other mindful bed makers out there. 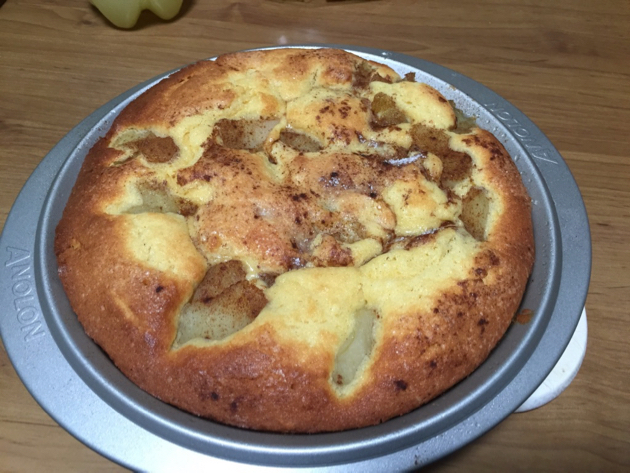 Apple and cinnamon butter cake. I set a task for myself two weeks ago to change my work room. I want to move all my ironing gear in there so it's out of the bedroom and in a space where I work already. I moved the ironing to the bedroom two years ago as a temporary measure and it's stayed there, reminding me of work when I'm trying to relax. If I just ploughed through it I would have had it moved in one day, but as I'm sure you know housework is rarely a linear activity, it is often interrupted, so the move is only partly done. Back in the day I would have been disappointed in myself for being so slow but now I accept it. I'm in a season of slowness, I'm not the fast and efficient workhorse I used to be and I'm fine with that. Self-acceptance, it's a fine thing and something we have to learn, and sometimes relearn. None of us will stay in our prime, if you live long enough you'll lose some of your strength, you won't work at the same pace all your life. All of us who live that long need to adjust our thinking to know that is okay, and that a slower rhythm is part of life and part of the balance most of us accept as we age. 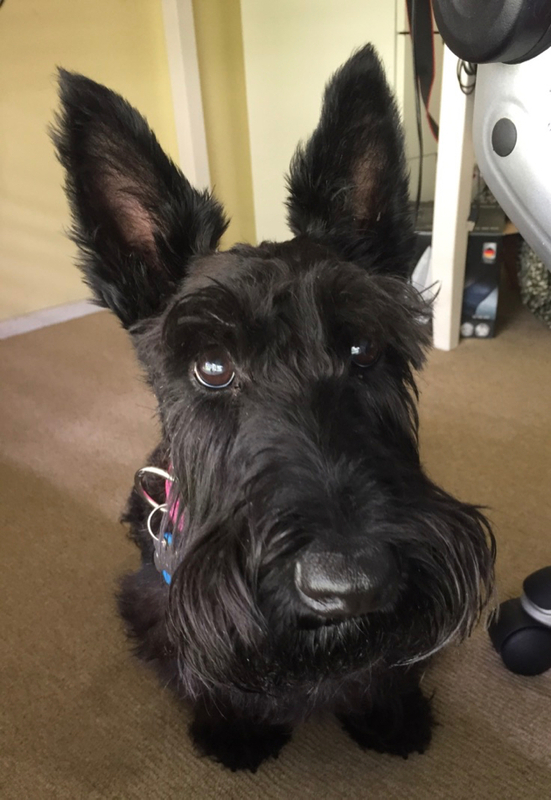 I've had quite a few readers ask about Gracie's food. What we feed our animals is important to me because I want them to have a good life and be in good health all through their lives. I've never fed our dogs supermarket food. If you look at the labels you'll see that it's full of rubbish and it's expensive. I prefer to give homemade food. I know what's in it, it smells good and it's value for money. 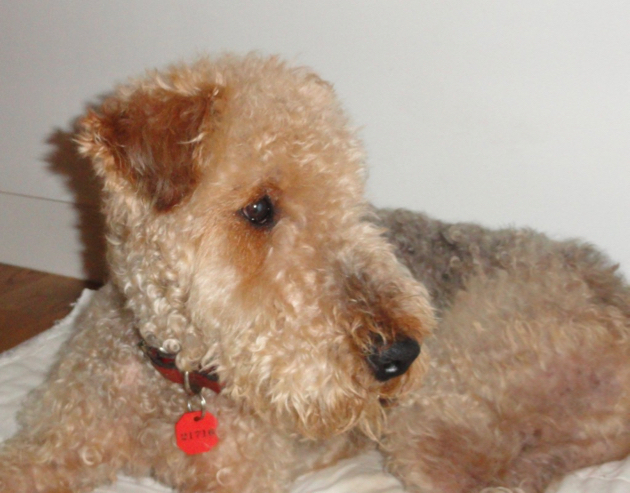 We had Airedale Terriers before Gracie and I made them a meat-based stew with rice. The dogs grew well on that food and my vet said they were the healthiest Airedales he'd seen. There are a number of recipes for dog food here and here is my recipe for what I used to cook for Rosie and Alice. From baby Gracie to today's Gracie, I've always done my best to feed her healthy food. 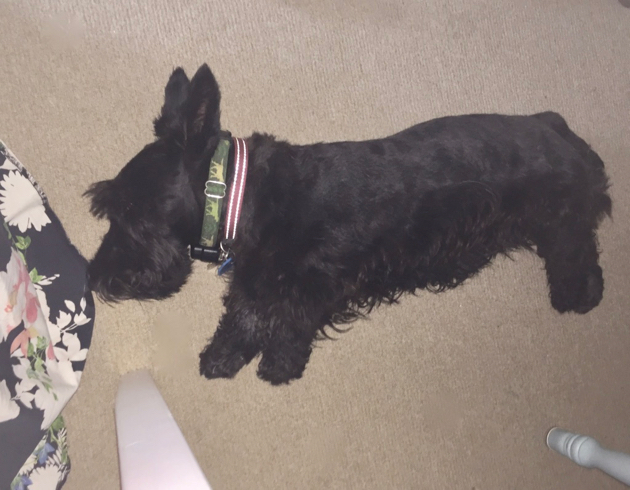 Gracie is a Scottish Terrier and she's half the size of Alice and Rosie so it made me think again about how we'd feed her. 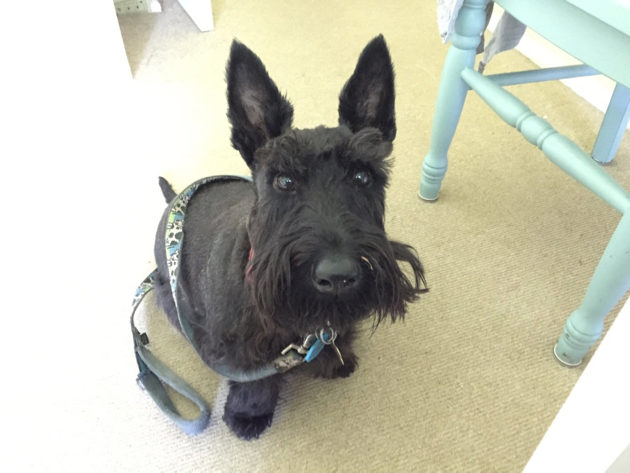 When she was a puppy, she had ½ cup Black Hawk biscuits for breakfast followed by a small amount of beef mince or chicken for lunch and dinner. When she was 12 months old, we cut her back to two small meals a day. Now she's 18 months old, the vet advised me to take her off the biscuits and have one meal. She has it around 2pm every day. That gives her time to run around in the afternoon to aid digestion but not be hungry overnight. This is our beautiful girl, Alice. After day 4, we start with day 1 again. This is how I prepare the chicken and vegetables in chicken jelly stock. Add 5 chicken drumsticks to a pot and just cover the chicken with water. Don't add salt, pepper or any other additive. During the cooking process, the chicken, bones and connective tissue start breaking down, collagen is released, and when it's cold, jelly forms. I think it gives Gracie the feeling that she's eating a bigger meal. Cook the chicken gently for about 45 minutes, then add the vegetables and cook for another 15 minutes. I generally use about a cup of sweet potato and carrots, cut into chunks, but you can use whatever you have on hand. Never give your dog onion or leeks. Allow this to cool, remove all the bones, then divide up into 5 even portions. 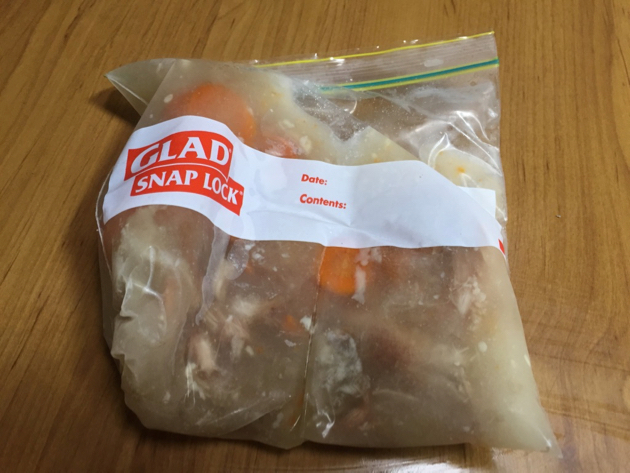 I use zip lock bags and freeze them flat so they don't take up too much space in the freezer. Of course you could cook up batches of 25 drumsticks so you only have to cook it once a month. When its defrosted, don't let it go to room temperature. Feed the dog when the liquid is still jelly. It will go back to a water consistency if you leave it sit for too long but even if you do, the nutrition is still the same. Feeding this 4 day menu rotation gives Gracie variety and different textures as well as bones to crunch for healthy gums and teeth. I think she's enjoying her food and it takes almost no time at all. For those in Australia, I buy the 3 star beef mince from Aldi and the chicken drumsticks from Woolworths - in the deli section, not the meat section. Last week the RSPCA-approved ones were on special for $3 a kilo, generally I pay about $5 a kilo for them. Using the drumsticks, I don't have to cut up any chicken, the portions are easy and clean to deal with and they have the nutritional value I'm looking for. BTW, Gracie weighs 10kg and these amounts suit her size. Make sure you work out how much food your dog needs per day so you give the correct amount. Food is such a personal thing. I don't expect everyone to change how they feed their dogs but I hope if you're looking for new ideas, this might might work for you and your dog. We went out to vote in our state election last Monday and took Gracie with us. Many of the people there supporting the politicians patted Grace and offered to hold her while we went in to vote. Dogs can certainly draw a crowd. 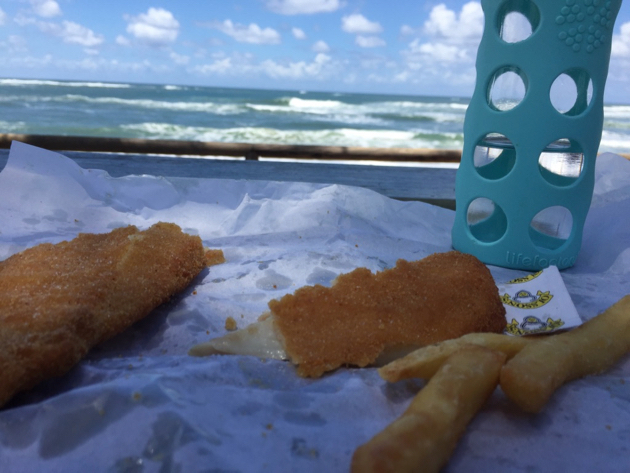 After voting, we picked up a few odds and ends, then bought fish and chips and headed for the beach. 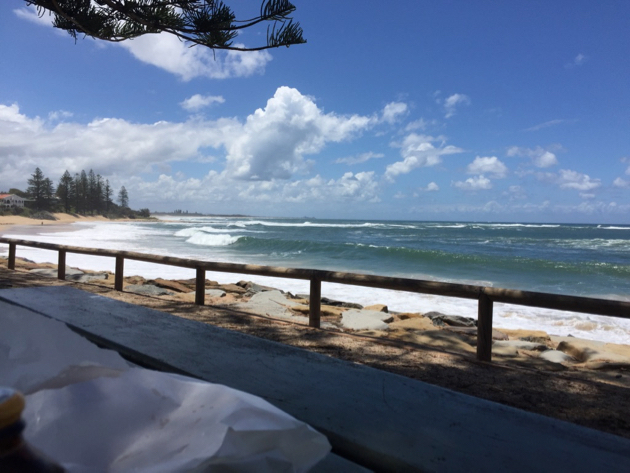 Sun, surf and an almost empty beach, bliss! It was a great way to spend a few hours away from home. I think Gracie enjoyed meeting all her new fans too. Using leftovers to create another meal has been part of my food management for as long as I can remember. 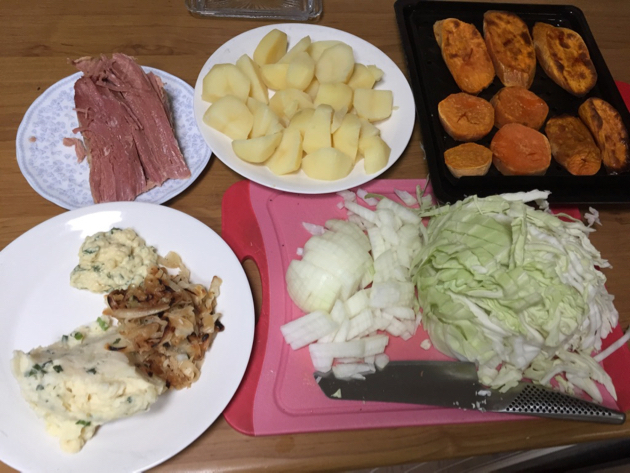 One of our favourite meals is corned beef hash and I made it this week with the leftovers of a meal of corned beef, fried cabbage, mashed potatoes and mustard and parsley sauce. I needed to add more vegetables because there are five of us eating here nowadays and the leftovers just wouldn't stretch that far. So I peeled more potatoes, one and a half sweet potatoes, a large onion and some cabbage. It's easier to develop that nice brown crispy coating on the hash if the potatoes and sweet potatoes you use are cold so cook then well before you cook the meal so they have time to cool down. 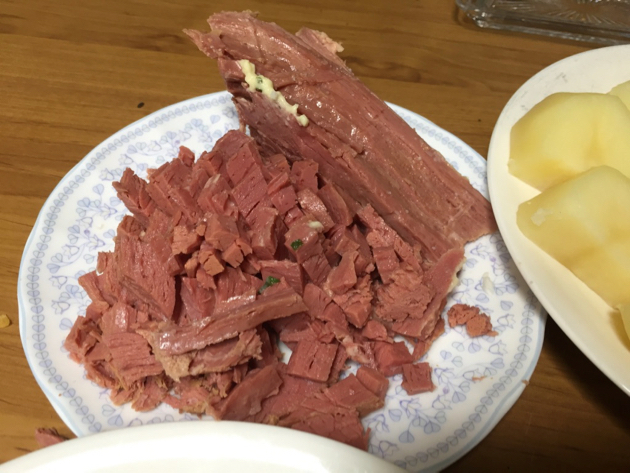 The leftovers were a large cup of mashed potatoes, half a cup of cooked cabbage, half a cup of mustard and parsley sauce and about 300 grams of cooked corned beef. 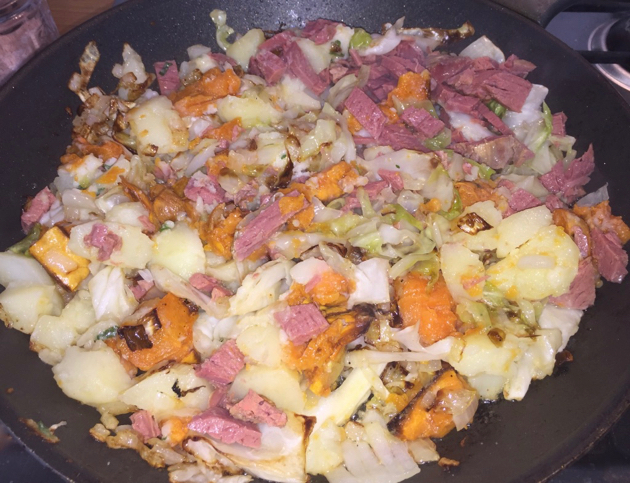 In a large frying pan, I cooked the uncooked vegetables first, when they were softened I added the cooked vegetables and the diced corned beef. These cooked slowly on a low heat to develop brown crispy bits. This took about 30 minutes and during that time I turned the mix a few times. Some of us had a fried egg with our hash, some didn't but everyone enjoyed it. 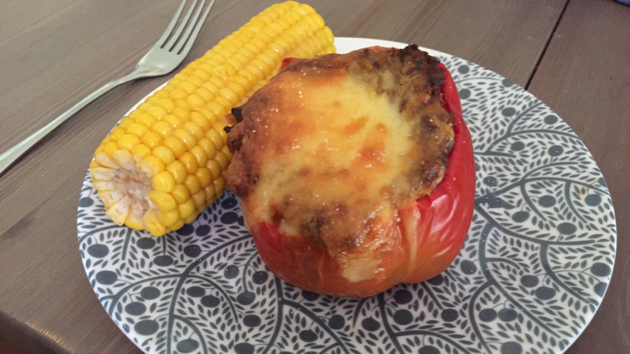 So, another easy meal without adding too much strain to the food budget. This is my favourite leftovers meal. What's yours? Here at our place Mondays are the same as Thursdays, Thursdays the same as Sundays; each day we get up and usually know what we have to do. If you don't live this way, you'd probably think it's a bit slow and possibly dull. But when I tell someone what I'm doing on any given day they're usually surprised and I think they wonder why I bother. 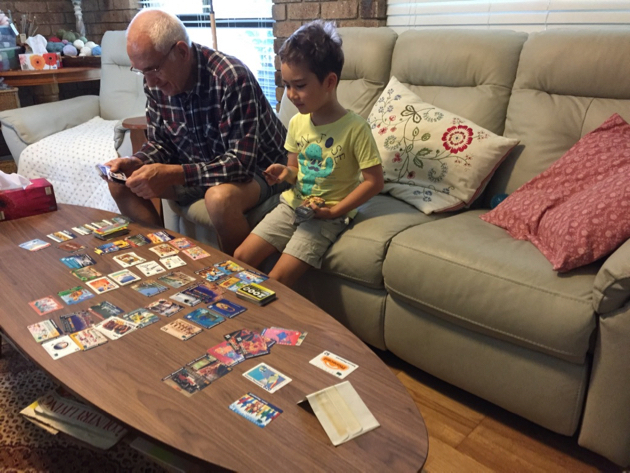 Hanno and Jamie sorting out the phonecards Kerry used to collect when he was young. Sunny's birthday lunch on Saturday. 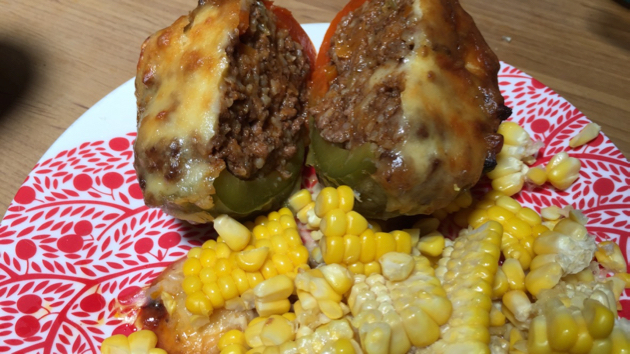 Above and below: a recent lunch - stuffed capsicums/peppers and corn. When we were in Tasmania last year, Hanno bought a pair of cashmere and merino gloves from the wool shop at Salamanca. They're so soft and light and very warm. Hanno has had a problem keeping his right hand warm since he had an accident a couple of years ago and gloves help a lot during winter. 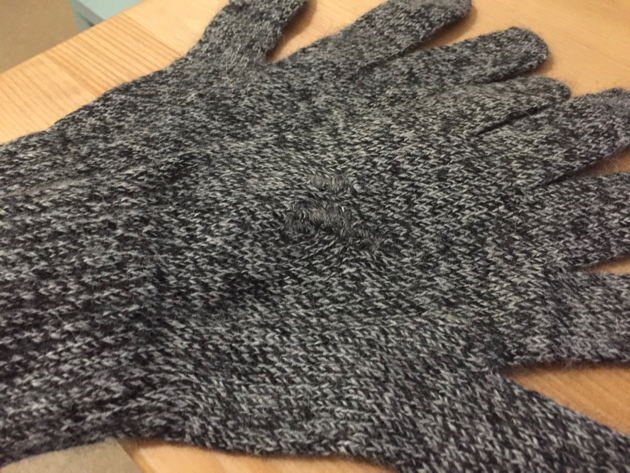 During a recent clean-up, I found the gloves and noticed they both had a few moth holes. 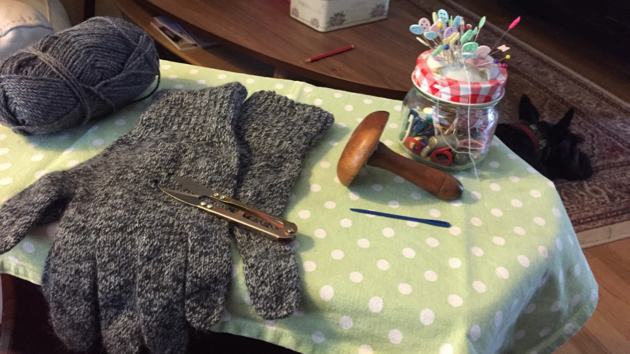 I didn't have wool that matched exactly, but I had grey wool, so I set out to darn the gloves so they could be used in years to come. 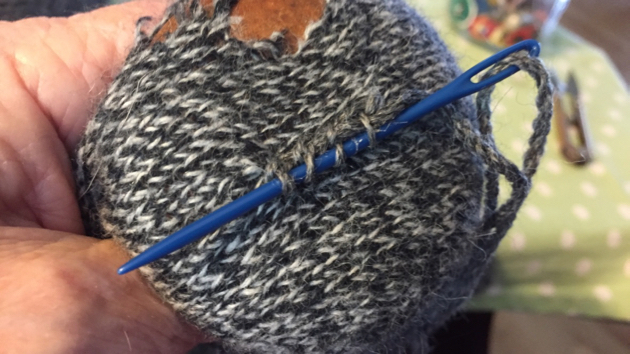 Darning is simply a matter of providing a surface to work on under the hole - I used a darning mushroom - and then with a darning needle, threading the needle through the threads that are still there and slowly rebuilding stitches over the hole. If you want to learn this valuable skill, there are many videos online but I like this one because it clearly shows the process. You can see the repaired hole above right in the middle of the glove but you can't see the other five holes I repaired. Finishing off the repair with a damp cotton cloth and a hottish iron, helps the repair blend in a bit more because it flattens the stitches. Now I'm storing the gloves in a plastic bag and hopefully, every time they're brought out to be used in winter, they'll be ready to wear again. And again. Most people now throw out clothing that might be saved with a small repair. And yes, I used to be one of those people, but now I'm more prudent and I understand the reason for spending a little bit of time to keep using what we have for as long as we can. For me, it has very little to do with economics. 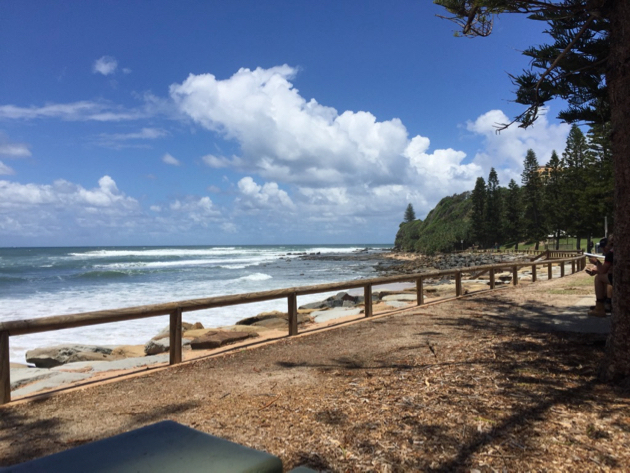 It's more about doing as much as I can and investing my time and effort into activities which enrich to our lives here without adding to the increasing burden being shouldered by our planet. If you visit us on any given day, we'll be repairing things around the house, cleaning, cooking, baking, growing food and generally taking care of ourselves and what we own. We could go to the shop and replace what is broken or torn but there is an exquisite art to life and I don't think consumerism is part of it. I think the art in all our lives is developed by exercising our creativity, developing our techniques and using the talents we have to sustain ourselves, even when the force of modern life tries to break through to disturb the serenity and simplicity of each day. It is an incredibly satisfying way to spend the life hours we have but a great shame that not nearly enough of us are doing it. 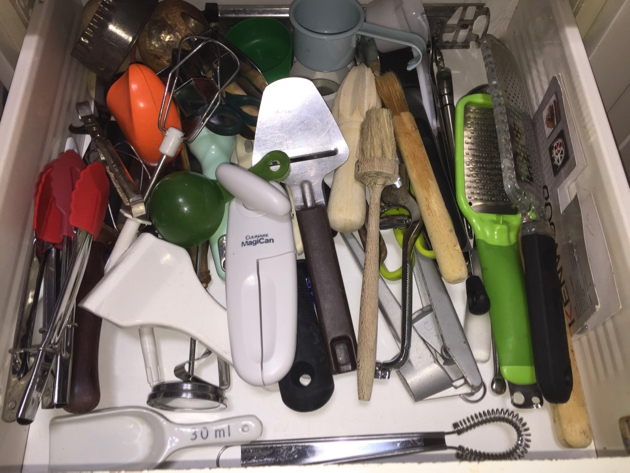 Yesterday, Clare commented on how difficult it is to keep her utensil drawer clean and tidy. I think it's a problem for many of us. I know my drawer is always untidy and here is a photo of it. 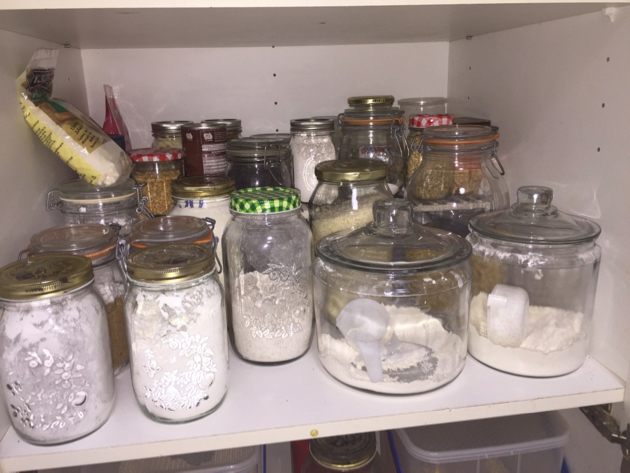 I've tried several ways to make it a bit more organised but it never lasts so now I just frequently take everything out, clean the drawer, then put it all back in. It takes five minutes. When I do this, I take the chance to cull anything that shouldn't be there. And even though it looks untidy, it is clean and it works for me. 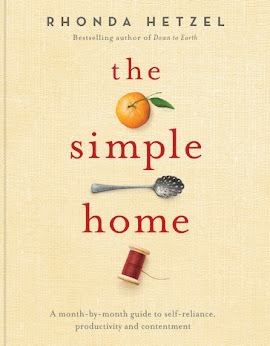 Clare, I think it's good to remember that the work we do in our homes will often look like what everyone else does, but sometimes it's nothing like it, and that is okay. When you find a solution that works for you, it doesn't matter if you're the only person who does it like that, you stick to the solutions that work. I hope you get your home set to support the way you have chosen to live. Once you've done all that work setting up, it's much easier to carry out daily chores and be content doing it. Good luck! It's still a busy time here at Hetzel House. We have Sunny's birthday lunch tomorrow and many days of contented activity after that. We're all getting along well together, Gracie hasn't caught Ec yet and Sunny and I are still going through cupboard, tile and floor samples and colours. No doubt Sunny will ask Sarndra's opinion tomorrow when she's here. I'm sure we'll come up with a simple and lovely home that they'll be very happy in. One of the things we did during the blog break was to continue on our quest to make things accessible and easy in our home. 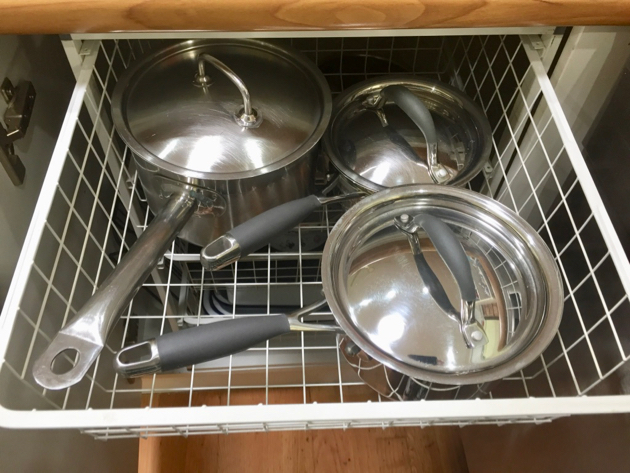 I'd been thinking about how I could rearrange my pots, pans and baking trays to have them at hand and easy to get at. They've been sitting in a corner blind cupboard next to the dishwasher for many years and many of them were shoved to the back well out of my reach. I didn't use those pots and trays and was surprised by a few of them when they saw the light of day again. 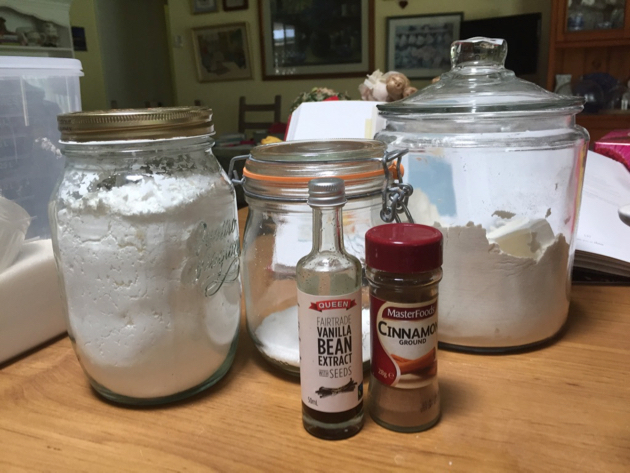 Like many of the readers here, I do a lot of cooking and baking and my equipment must be easy to reach in the storage space I have available. The need for that will be greater in coming years. 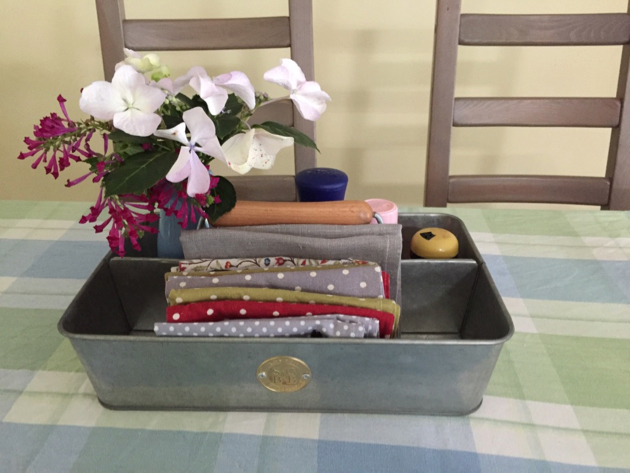 I don't want to give up baking just because I can't reach my trays and baking tins. We always try to use what we have here and happened to have a set of metal drawers that I bought years ago at Howards. 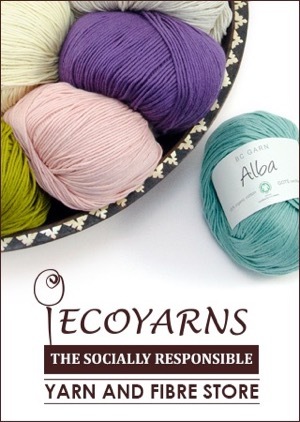 I've been using it to store various types of clothing and colours waiting to be washed. Hanno fit it into the cupboard space and with minor tweaking, it fit - giving me four good sized drawers to fill with my pots and pans. But I still had bakeware and frying pans to deal with. 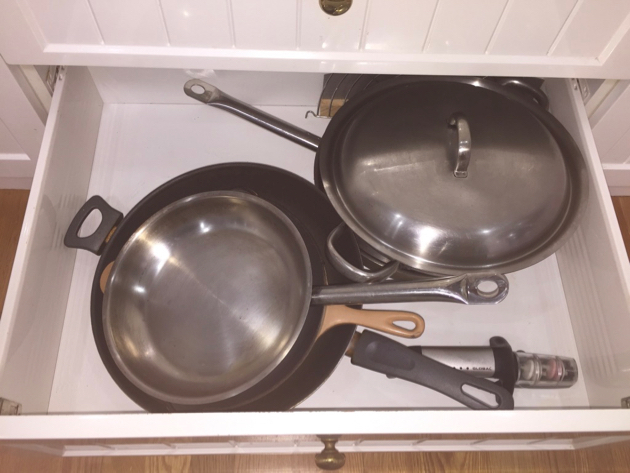 I cleaned out the lower large drawer under the stove and placed all the frying pans in there. They're easy to get at as they're just under the stove. Perfect! Then the toughest group, the bakeware. 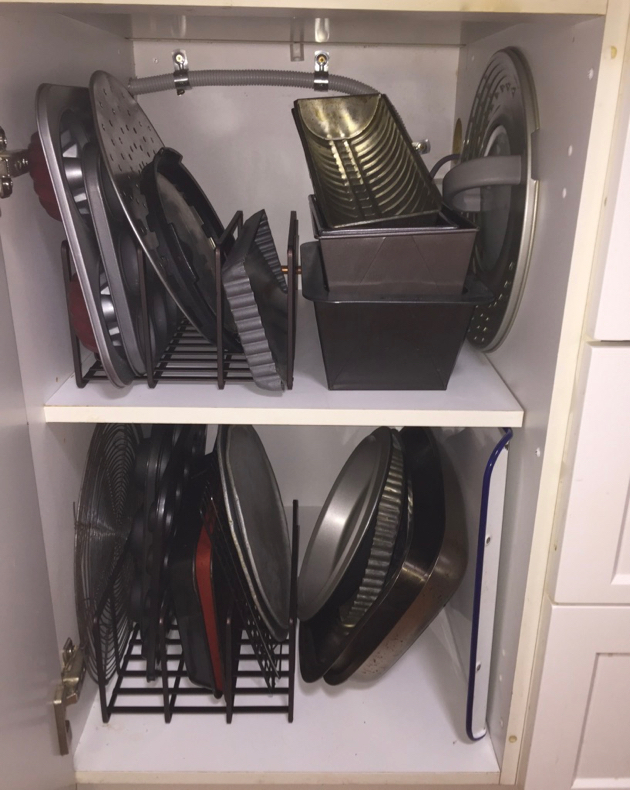 They're all different sizes - bread pans, biscuit trays, cake pans of all shapes and sizes, pizza trays, wire racks, muffin trays, quiche and tart tins. I had these in a lower cupboard but few of them were the same shape or size so they were very difficult to store. 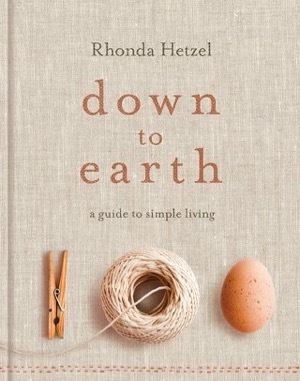 Often when I needed something, the whole lot toppled over and I felt like throwing them out. 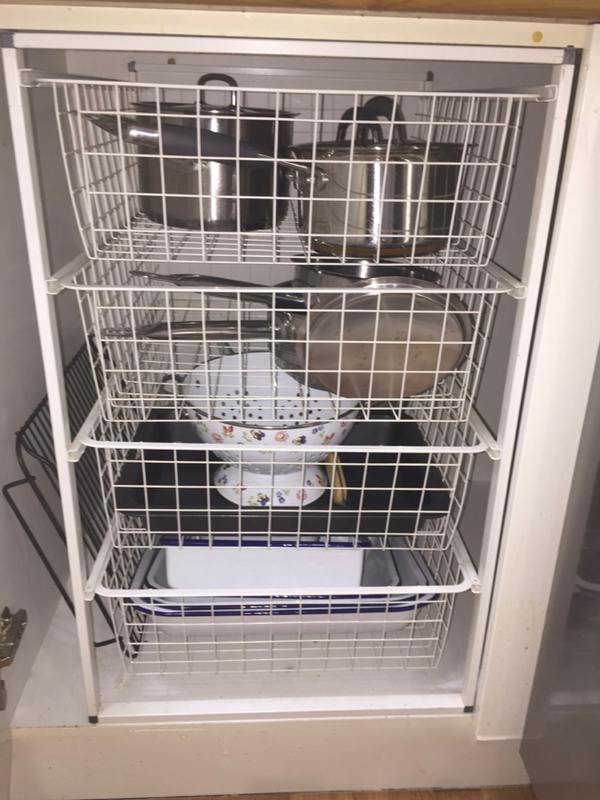 So, simple solution, I went to Howards and bought two heavy metal racks like this, and they're working brilliantly on the top and bottom shelves. Now I can see everything I have in there and it's only my bread and loaf tins that are stacked on top of each other. This system is so easy. I can see myself working with it well into the future. All it cost was time and effort in cleaning out the drawers and cupboards, and about $30 for the racks. I'm very pleased that I made the effort to do it because already it's made the world of difference. Do you have spaces like this in your home that need reorganising? They usually take a couple of hours work but it's time well spent if you dive into it. BTW, that is my black floral dress near her nose. Hello strangers. It's been like dominoes falling during these passed weeks. One thing lead to another and sometimes we didn't know if one domino or 100 would fall. But we followed our noses, did what we had to and I've come back to you with a newly renovated laundry, a freshly painted toilet, three new house guests and a cat. 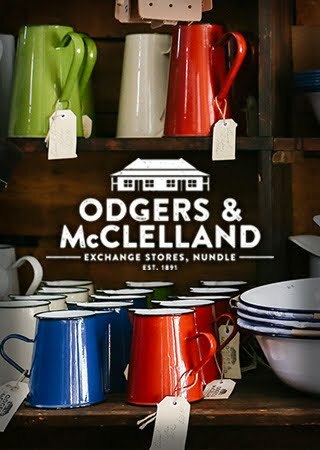 I got this metal trug from Odgers and McClelland. It's very handy for storing napkins, salt, pepper and flowers on the kitchen table. As you know, Kerry, Sunny, Jamie and his cat moved in with us to wait for work on their new home to be completed. The house is moving along nicely, the roof is on and walls are going up so that now, even if it starts raining, work can go ahead. They've been told they can move in before Christmas. They've decluttered, cleaned out their apartment and moved in here. Their belongings are stored in our big shed, so a big portion of the work has been completed and the excitement is beginning to grow. 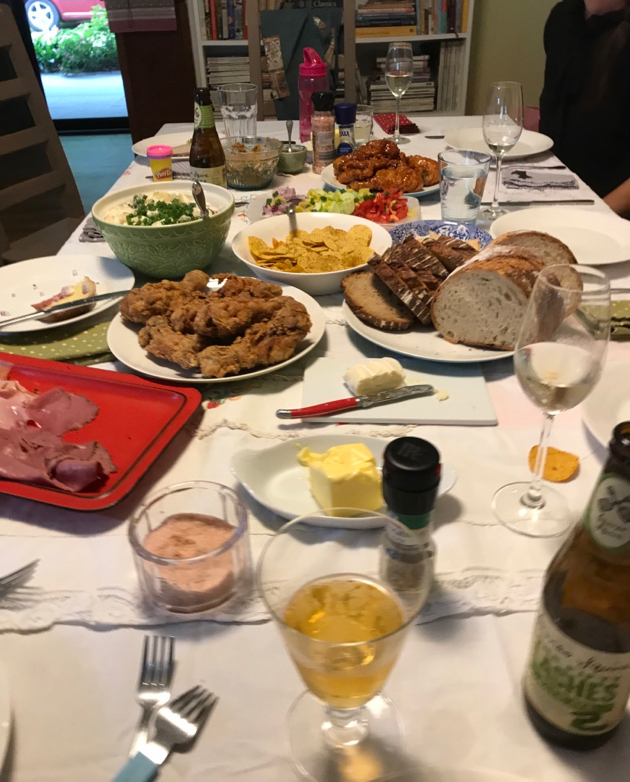 In our newly established family of five, I've taken on the job of chief cook, not a job to be taken lightly with two chefs and a six year old to feed, and I'm slowly getting used to shopping for a family again. 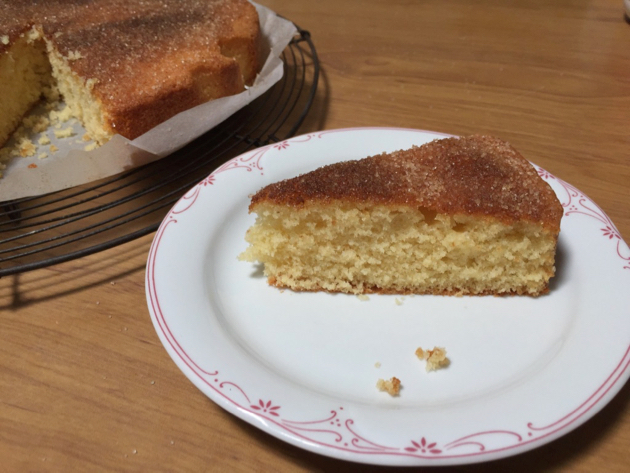 Cinnamon tea cake. A great cake for lunch boxes and morning teas. I had wondered how it would all go. I thought there'd be problems with Gracie and Ec, the cat, and I wondered how everyone would cope with me wandering around during the night when I couldn't sleep. Blending families is never easy but so far, it has been. Beds still need to be made, food cooked, shopping done, the garden and floors need tending and every day, by the time our regular home chores are done, our guests return from school and work and we all settle in again. It feels familiar and different and so far, it's been easy. Hanno asked me to thank you all for your well wishes. He's still not 100 percent, he's on a second course of antibiotics but says he's feeling better, although I can see he tires easily. 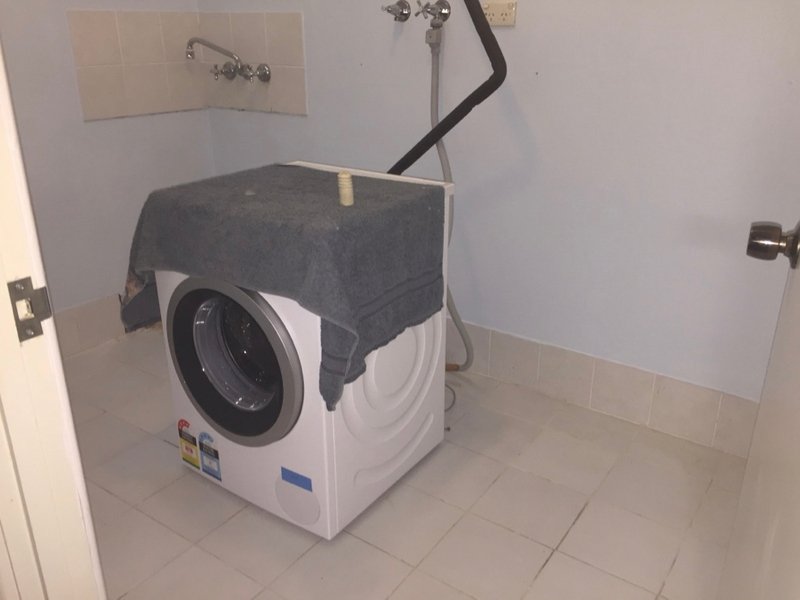 However, at 77 years of age, with a small amount of help from me and a handyman from Airtasker, he renovated the laundry. That job started when I noticed that our eleven year old washing machine was leaking. Most of you know we're going through a period of reorganisation and preparedness. We're updating appliances and replacing them with water and energy efficient models so we can hopefully sail through the next decade with household equipment that supports the way we've chosen to live. So we had a new washing machine installed, then I noticed the laundry sink and metal unit it sat on was rusting from the floor up. Hanno ripped that out and discovered there had been a leak in the wall so I was very pleased he found it and fixed the problem. 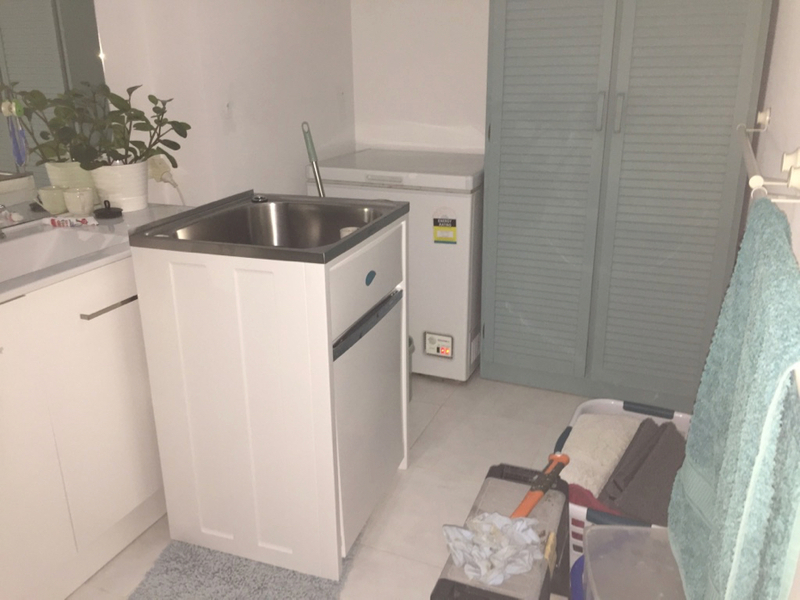 A new unit was bought and he connected the waste pipes from the washing machine and air conditioner. When the new unit was up, the existing tiles didn't cover the area behind the unit so we got a handyman in to add more tiles. 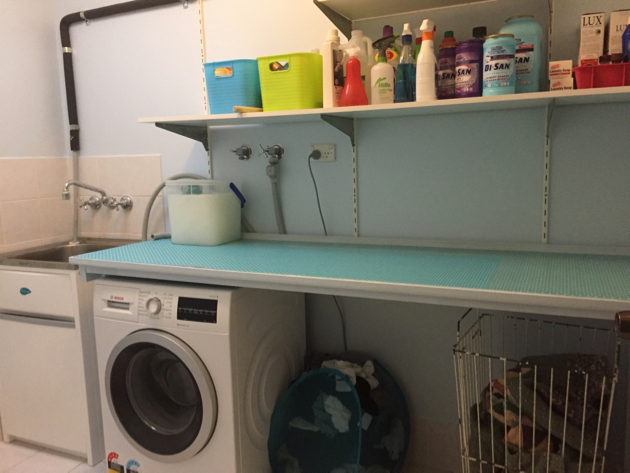 He also replaced the water damaged plasterboard behind the sink unit and painted the laundry and toilet. I was so pleased to see the work completed because at one stage I was wishing we'd never started it. We sold the old machine on Gumtree and replaced it with the Bosch model recommended by Choice magazine. For overseas readers, Choice is an Australian consumer advocacy organisation which tests and recommends products and services used in our homes. We're all catching up on the washing that piled up for a week and the new machine is coping very well with the task. Now I'm starting to think about Sunny's 40 birthday next Saturday. We're having a cooked-from-scratch family lunch for seven adults and three children. I'm still finalising the menu and trying to decide on the birthday cake. I'll let you know more about it later and, of course, they'll be some photos on the day. 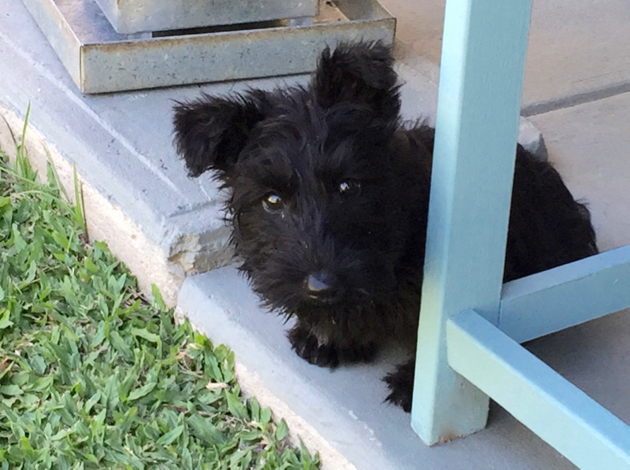 Many of you contact me about Gracie and want to know more about her. Here she is with her lead on waiting to be taken out. I'll have more Gracie news next week. I thought I'd be back with you by now but Hanno is sick again with a bad cold that we're hoping won't turn into another bout of pneumonia. Our main focus at the moment, and what we've been preparing for these passed couple of weeks, is getting the house ready for Kerry, Sunny and Jamie to move in. I know! Big surprise, eh? Their first ever house is being built and will be ready to move into before Christmas. They're very excited about it because they've worked so hard to make it happen. The lease on the apartment they're living in now expires next week, so they'll move in with us until the house is ready for them. Both Kerry and Sunny are absolutely exhausted. They've both been working in their shops all day and taking Jamie to school and after-school activities, while working with the builders and deciding on colours and fixtures and making sure all the council requirements and paper work is done properly. And now they're packing up their apartment and decluttering after work when all they want to do is sleep. Having them here will give Hanno and I a chance to look after them during this very busy time. While they're here they won't have to do any housework, shopping or cooking and we're on hand to look after Jamie. They'll be free to work and focus on the house. I think it will be a very busy and happy time here at the Hetzel house. I'll be back as soon as I can be. I'm not sure when that will be, possible early next week. 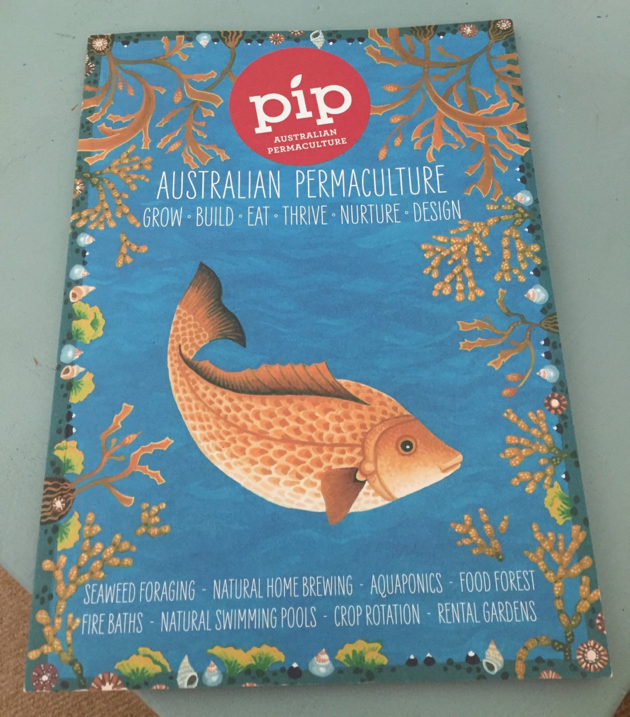 While I'm here I wanted to let you know that I have an article in the current edition of the PIP Australian Permaculture magazine. Here are the shops where you can pick up a copy. 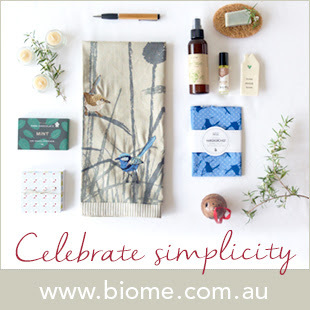 I'm pleased to say that the wonderful Biome shops in Brisbane stock it and if your newsagent doesn't have it, ask them to get it in for you or subscribe through the PIP website. The magazine is full of interesting, thoughtful and educational information and it is brilliantly illustrated. 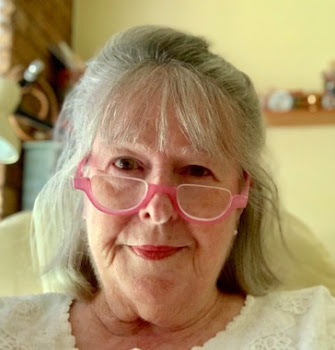 My good friend Morag Gamble has her regular article on Permaculture Around the World, the feature articles are on seaweed and aquaponics, there's a family section with kids' pages and 10 Ways to Get Kids off Screens and into Nature. 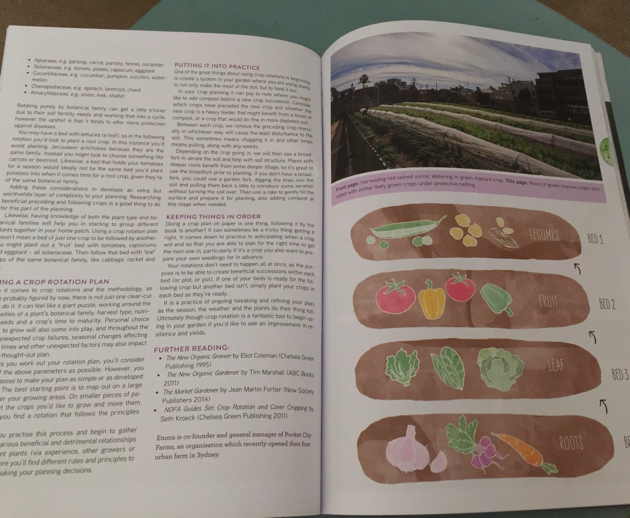 Add to that an excellent rundown on Crop Rotation and Rental Gardening, a Strawbale building project, Save your Seeds by Jude and Michel Fanton of the Seed Savers Network, designing a Food Forest and Homegrown Herbal Skincare. 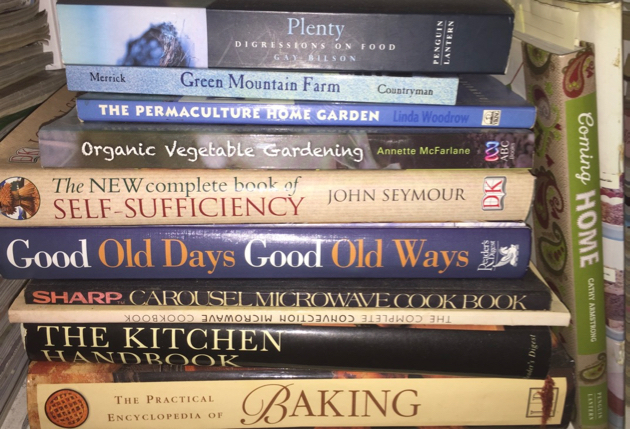 But there is much more to read for everyone interested in living our beautiful lifestyle while developing practical and traditional skills or wanting to grow food and develop self-reliance. My congratulations to publisher/editor Robyn Rosenfeldt and the staff of PIP on the production of this excellent and practical resource. It's been published for less than three years but it has already developed into a must-read vibrant magazine.